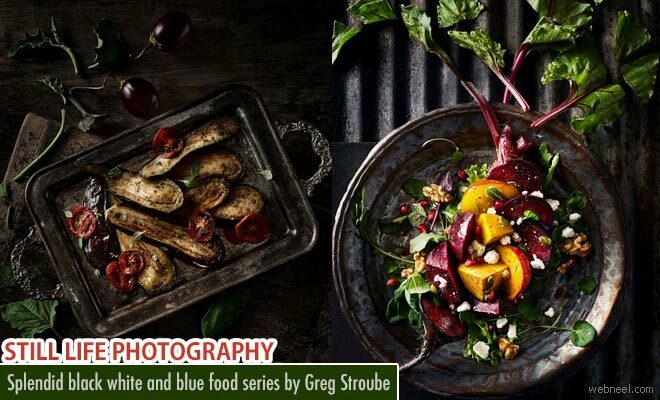 Food Photography : Greg Stroube is an American photographer who has more than 30 years of expertise in digital and fine arts photography. With an eye for precision and a problem-solving mind Greg continuos to explore into new genres resulting in magnificient photographs. The limited colour palatte series which he designed recently focussed on black,white and blue colours. These three colours are rarely used in culinary context as many ingredients in these are unlikely like squid ink pasta, purple sweet potatoes and waxy honeycomb. Inspired team of Greg baked up a new tart with a different fruit to see which looked prettier and finaly composed the shot, which they enjoyed with fun.